For Mother’s Day this year, my brother and I promised that we would cook dinner. 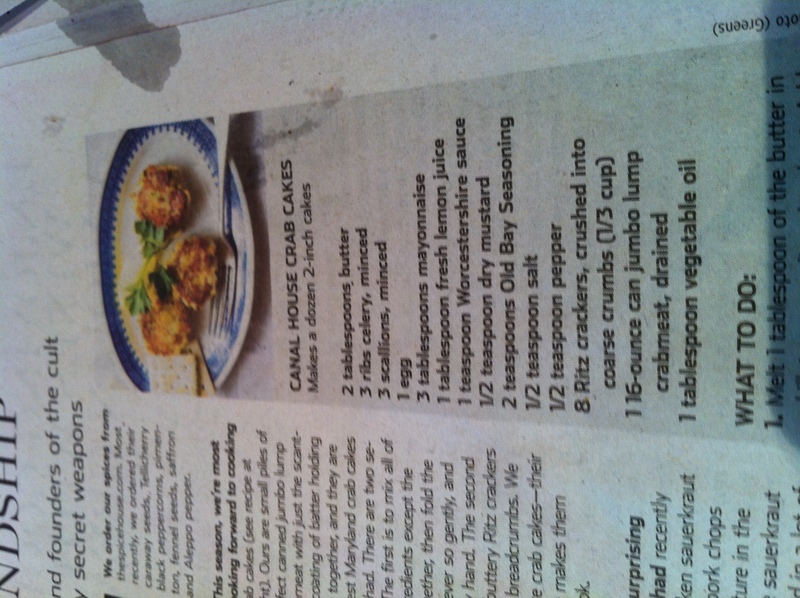 Perhaps in an effort to exact revenge for the many times I made Mom assemble The World’s Most Difficult Birthday Cake, she put crab cakes on her menu. I’m not saying crab cakes are inherently difficult, but I had never made them before. And, the mere mention of the word cake shakes me up a little, given my baking history. But, MoSB did me a favor by choosing the recipe she wanted from Canal House Cooking, printed in this Wall Street Journal article. The Canal House is not a restaurant but a series of cookbooks, published quarterly. Their latest volume, The Grocery Store, features recipes for Asparagus Bread Pudding and Boston Cream Pie, both of which are depicted in luscious photos. Given their reputation for recipes that focus on simple preparation and high quality ingredients, I had high hopes for the crab cakes. We doubled the recipe for Mother’s Day, but found we had to triple the scant amount of required (Ritz!) crackers to get cakes that didn’t fall apart. 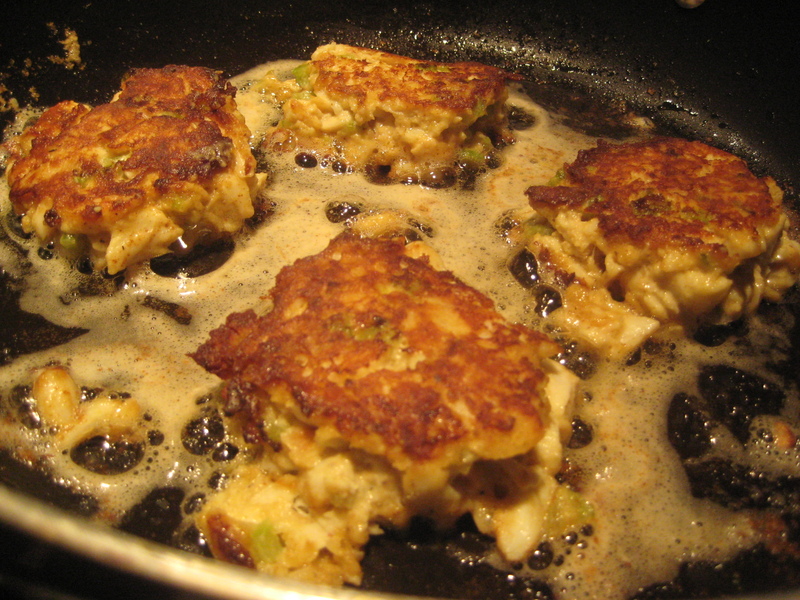 I consider this a good thing – nobody wants mealy, mushy, bready crab cakes. The focus should be on the flavor of the crab, and Canal House Cooking definitely agrees. Really, the entire success of this dish depends on the quality of crab that you use. Don’t skimp. A crucial step in this recipe is chilling – they suggest 1-2 hours. Because the cakes don’t have much filler, they will be impossible to cook if they don’t have the chance to firm up. When you do cook them, be gentle. Once the pan is heated, turn down to medium and cook slowly, 4-6 minutes per side. Voila! They look GREAT! Did Pat make a torte for dessert?